Robert J. “Bob” Antal, 73, of Seville, died Tuesday, January 3, 2017 at his residence following a courageous battle with cancer. He was born November 30, 1943 in Medina to the late Stephen and Mary (Kisvardi) Antal and has lived in Seville most of his life. Bob graduated from Cloverleaf High School in the class of 1963. Following graduation he served his country in the U.S. Army. He married “the cutest and most wonderful girl he had ever known”, Linda Dempsey, on June 6, 1965. He worked as an Office Manager for the Ohio Edison Company for 36 years, retiring in 2004. 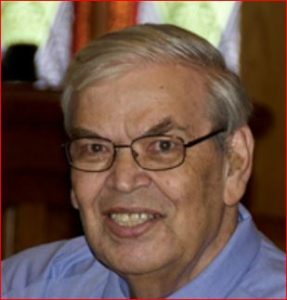 Bob was a devoted husband and father and faithful and active member of the Seville Presbyterian Church. His favorite pastime was spending time with family, enjoying many vacations, especially cruises; singing in the choir, watching golf on T.V. and the many groups and activities he participated in with his church family. One of his greatest passions was granting his girls their every wish. Surviving is his wife, Linda; daughters, Dina (Jim) Bozigar of Wadsworth and Tara (Matthew) Scherler of Seville; grandchildren, Michael, Alex and Sidney; sisters, Wilma Richards and Barbara Steir both of California, Joan Pritchard and Betty (George) Beshire both of Chippewa Lake, Yvonne (Wilbur) Wiley of Lodi and Carol (Neal) Sylvester of Medina; brother-in-law, Howard “Ozzie” Babbs of West Salem; sister-in-law, Dee Antal of Parma; and numerous nieces and nephews. He was preceded in death by his parents; brothers, Steven and Richard Antal; and sisters, Mary Ellen Antal and Arlene Babbs. Services will be held Saturday, January 7, 2017 at 11:00 a.m. at Seville Presbyterian Church, 101 Center St., Seville with Rev. Richard Wereley officiating. Burial will take place at a later date at Ohio Western Reserve National Cemetery. Friends may call from 4 to 7 p.m. on Friday, January 6 at the church. Memorial contributions may be made to Seville Presbyterian Church in c/o Music Patron Program or Medina County Hospice, 5075 Windfall Rd, Medina, OH 44256.